Parents got to find out what it’s really like to be preschooler at The Goddard School in Hanover, MD. For every parent that has wondered what it would be like to be a preschooler again, the Goddard Schools are providing that opportunity with the A Day in the Life of a Preschooler event. This week at Goddard Schools nationwide, parents are experiencing what it’s like during a typical day at preschool. During the A Day in the Life of a Preschooler event, parents will gain a better understanding of the FLEX Learning experience. The Goddard School® FLEX Learning Program is designed to instill in your child a lifelong love of learning. Developed with the assistance of early childhood education experts, FLEX Learning is based on the latest research on how children learn. The program’s foundation is the learning continuum that encompasses developmental guidelines with formative assessments, child-focused lesson plans, a creative and fun environment and a personalized child-centered approach that meets your child’s needs. My husband and I are concerned for our 5-year-old child. He was picked on by a couple of classmates last year. Now he’s starting kindergarten and is in the same class as some of the kids who picked on him the previous year. We would like him to learn early to stand up for himself. What steps should we be taking both at home and school so that our son doesn’t fall victim to bullies? Bullying is a common experience for many children and adolescents. When your child is the victim of bullying it’s best to make sure the lines of communication are open, no matter how old the children are. Parents and teachers are sometimes reluctant to intervene in conflicts between young children. They don’t want to see children harm or ridicule one another, but they want to encourage children to learn how to work out problems for themselves. Demonstrate assertive behavior (e.g., saying “No” to another child’s unacceptable demands) and contrast aggressive or submissive responses through demonstrations. Let children role-play with puppets or dolls. Teach children to seek help when confronted by the abuse of power (physical abuse, sexual abuse, or other) by children or adults. Remind children to ignore routine teasing by turning their heads or walking away. Not all provocative behavior must be acknowledged. Teach children to ask for things directly and respond directly to each other. Friendly suggestions are taken more readily than bossy demands. Teach children to ask nicely, and to respond appropriately to polite requests. Show children how to tell bullies to stop hurtful acts and to stand up for themselves when they are being treated unfairly. Encourage children not to give up objects or territory to bullies (e.g., say, “I’m using this toy now”). Preventing bullies from getting what they want will discourage aggressive behavior. Show children the rewards of personal achievement through standing up for themselves, rather than depending on the approval of others solely. The key to promoting positive interactions among young children is teaching them to assert themselves effectively. Children who express their feelings and needs while respecting those of others will be neither victims nor aggressors. I hope these suggestions are a good starting point for you and your husband. Director of Education, Goddard Systems Inc. If you have a question for “Ask the Expert” send an email to AskGoddardSchool@goddardsystems.com. 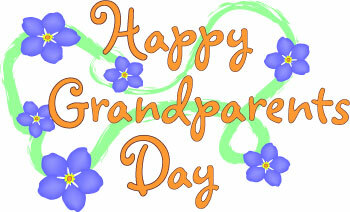 From education to encouragement and advice, grandparents’ involvement can play a significant role in a child’s life. On September 13, 2009, National Grandparents Day will recognize the special bond between a grandchild and grandparent by providing a wonderful opportunity for kids to celebrate and honor their relationship. Hand-Dyed Handkerchiefs. Lay out colorful flowers underneath a plain white handkerchief. Crush the flowers with a mallet. The color from the flowers will dye onto the hanky in an assortment of beautiful patterns. Flower Pot Pen. Now anytime your grandparents write, they can think of you! Just paint a small flower pot and fill it with green flower foam. Cover the foam with moss and glue a pen cap into the foam. Wrap the pen with green flower tape and you will have a pen disguised as a flower pot! Build a Car. Gather together boxes of all sizes with the tops and/or bottoms cut out. You can use drink boxes, shoe boxes, cereal boxes, milk cartons, gift boxes, etc. Paint the boxes a few days before Grandparents Day, so the paint has achance to dry. Gather the boxes that the child has painted along with four wooden wheels. Work together with Grandma/Grandpa to build a car out of the boxes. You can even take a picture together and put it where the windows would be. Flower Bouquet. Make cut-outs of different types of flowers. Decorate the flowers with tissue paper, buttons, felt pieces, foam pieces, crayons, markers, paint, etc. Once the flowers are ready, attach them to either pipe cleaners or small wooden craft sticks (painted green). Wrap the flowers in tissue paper by the stems to create a beautiful bouquet! Neckties. Now Grandpa can dress up in style with this adorable necktie. Create cutouts of an oversized necktie and decorate the tie with pieces of fabric. Be creative and use exciting fabric designs like sports, cars, animals, etc. Glue a piece of string to the top of the necktie and have it ready for Grandpa to wear! Preschool Helps Parents Make Friends Too! According to a recent U.S. study children are not the only ones making friends when they go off to preschool. Researchers from the University of Chicago found that parents are building friendships and support networks in school as well. A great resource for parents is other parents and the best place to find them is at their child’s school. It becomes a place where parents can talk, ask questions and find support for concerns such as a child development, finding good health care, etc. Join the School’s Home-School Association. One of the goals of this organization is to provide opportunities for families to meet and mingle. Many activities occur after school hours, such as a Saturday trip to a pumpkin patch. These outings encourage relationships among families. These activities are usually planned at monthly meetings by the Association’s board who provide a calendar to all families. Host or take part in charity or community outreach events. Home-School Associations are often integral in the scheduling and organization of canned food drives, gently worn coat drives, etc. –In addition, each School’s Owner and Director plan numerous events throughout the year to bring families together: Family Appreciation Days, Thanksgiving Celebration and holiday festivities.